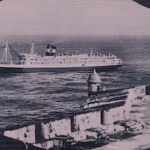 The Bull Lines and the mid-century S.S. Puerto Rico. Le Cirque’s famous owner Sirio Maccioni started as a waiter “crossing the pond” aboard the Home Lines SS ATLANTIC. 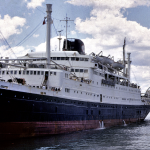 Messageries Maritimes – Passenger liner arriving from Vietnam. Cruise Ship History – $250 for 18 Day Cruise from New York to Peru – Dining “under the stars” aboard Grace Line first class Santa Class ships during the 1930s – A brief maritime history of the Grace Line (W. R. Grace & Co.), New York 1882-1969.